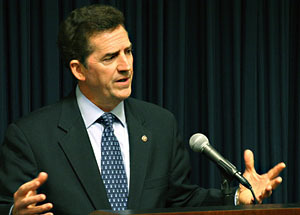 Sen. Jim DeMint is opposed to Obama’s tax deal. No surprise there. But what is this all about? Huh? It raises the death tax? DeMint is talking here about the estate tax, which, admittedly, is zero at the moment thanks to bizarre tax law writing from Republicans. But in three weeks it automatically reverts to an exemption of $1 million and a rate of 55% on everything above that level. That’s pretty high. Or maybe the proper point of comparison is the 2009 level: a $3.5 million exemption and a 45% rate. Well, compare away. The Obama deal sets the exemption at $5 million and the rate at 35%. That’s lower than the most recent rate and much lower than the rate that will shortly go into effect if there’s no tax deal. So what is DeMint’s problem? I dunno. Does he honestly think that maybe Dems will eventually negotiate a rate of zero if he just holds out long enough? Hell, they’re in open revolt over the current deal, let alone one that repeals the estate tax completely. What are they smoking down in South Carolina these days?